This model shows how to simulate a key multi-discipline design problem from the Aerospace Defense industry sector. This example contains subsystems that model the essential features of a radar system. The model is typical of a radar system that is used for target position and velocity detection. The example includes a radar pulse generator, an RF Transmitter subsystem, a Simulink representation of a moving target, an RF Receiver and a Receive Module (Rx Module). The radar Pulse Generator creates a swept frequency signal (chirp signal) that has a 10 percent duty cycle. 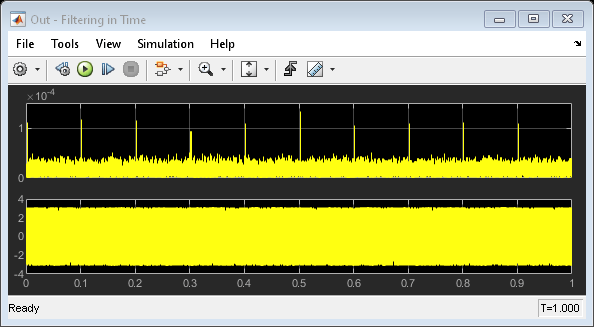 The subsystem is implemented by using Simulink® blocks and a signal from the MATLAB workspace that represents a chirp signal. This Subsystem is implemented with both core Simulink blocks as well as blocks from the RF Blockset Equivalent Baseband library. The RF Blockset subsystem represents a traveling wave tube amplifier. 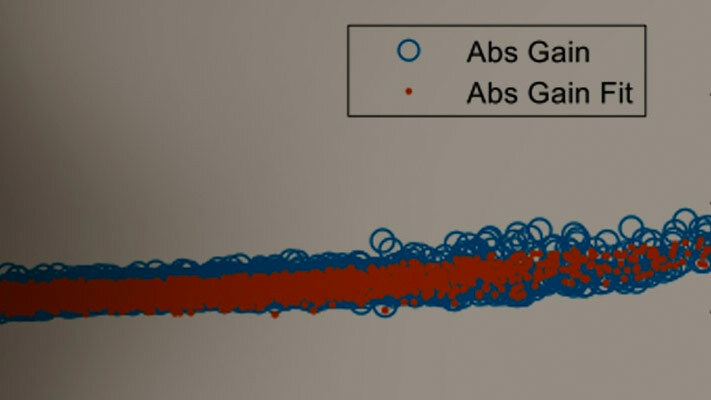 An ideal antenna is implemented via a Simulink gain block. Within the subsystem, there are DSP System Toolbox blocks used for calculating the power level of the baseband signal. The Target is implemented using theoretical implementations of a moving target that fully reflects all of the incident signal off of its cross-sectional surface, which is perpendicular to the direction of travel of the incident radar pulses. The RF Receiver is implemented using the RF Blockset Equivalent Baseband library. The RF receiver is a super heterodyne receiver. The LNA is a matched amplifier. For broadband impedance matching, see the example of RF Toolbox: Designing Broadband Matching Networks (Part 2: Amplifier) (RF Toolbox). The LNA is represented by a Touchstone® data file with noise data. The name of the datafile is samplebjt.s2p. Following the amplifier are behavioral models for a bandpass filter, mixer and a high gain, high noise amplifier. The Rx Module in this example serves two purposes. First, the module contains a matched filter detector for target detection. 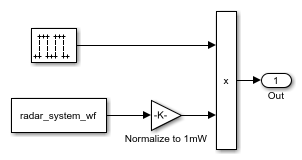 Also, this module serves as a testbench where a theoretical filter implementation is realized via Simulink blocks, the output of each of these filters is compared, and the difference is plotted. You can set the target cross section, target speed, and relative distance to the target by double-clicking the Target icon and specifying the corresponding parameters. At sufficiently large distances, the return signal cannot be detected within the noise. Similarly, the return signal cannot be detected in the noise if the target cross section is too small. After simulation, open four time-domain signal graphs of interest for examination. 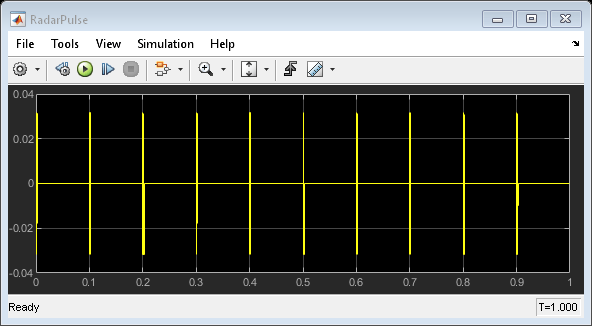 The first graph, "RadarPulse", displays the time-domain representation of a chirp signal with a 10% duty cycle. The second graph, "Out - Filtering in Time", displays the magnitude and phase of the filtered return signal with noise. 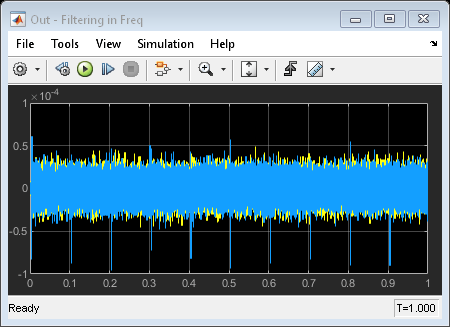 The third graph, "Out - Filtering in Frequency", displays the real and imaginary response of the filtered return signal with noise through an ideal filter implementation. The fourth graph, "Diff", displays the difference between the results obtained in calculating the results for graphs two and three. The Tx Amplitude (dBW) block displays the power transmitted in dBW. The Rx Amplitude (dBW) block displays the target return power in dBW.